Quote-to-Cash Certification, is a free certification program designed for quoting and contracting knowledge. This certification consists of five video modules, followed by an online test to earn certification badge. You need to register for this course on http://www.apttus.com/certification/ . After registration, you will get access to 5 training videos and study guide which will help you to clear the certification quiz. This training module will give you functional knowledge of Quote to cash process, helps in understanding CPQ and will explain what are challenges customers are facing to close deals faster . It also describe the functionality provide by APTTUS –Quote to cash package in order to deal with all the challenges while proposing deals or closing the deals. 100% native to Salesforce so need to integrate it with any 3rd party quoting tool. Marked as favorites: Sales reps can specify products or combination of different products as favorites so that they don’t have to search it every time. Ability to configure discounts at account or partner level, quote level and quote line item level. Availability of API’s related to all CPQ functionality so that developers can customize the app based on customer requirements. Ability to configure E-commerce for external customer easily by using Exposed API’s provided by APTTUS. Force.com CLI tool allows you to interact directly with Force.com from your command-line. Functionality includes exporting metadata and packages created in SFDC to a local directory, browsing data objects, executing SOQL queries, executing APEX code,managing custom objects etc. Download Force.com CLI executable file and store it in some folder. Suppose my folder name is "CLI Demo" present in E: drive. If you are getting version information then it means CLI is configured correctly. Otherwise if you getting some error, then set system variable by navigating computer->my properties-Advanced system settings->Environment variables. 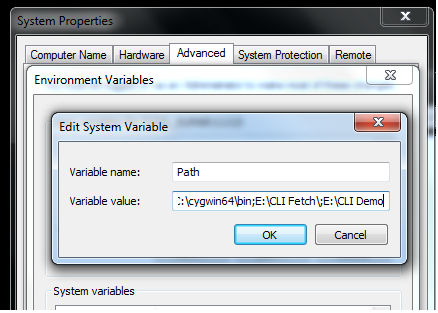 Provide CLI Demo folder location in path variable. Create a package: Go to SetUp-> Create->Packages. Create a new package and include all elements which you want to export from SFDC. Now metadata folder is created in CLI Demo folder which contain all components information present in package. If you open it, you will see package.xml containing all components list. Note: If you deploy components in SFDC org using Workbench, then Force.com CLI will help you create package.xml file easily. You don’t have to manually create package.xml file. Just create package in your source org and Fetch it with Force.com CLI and the zip all contents (package.xml and all folders present in ForceCLIDemoPackage). After this deploy the zip file using workbench to target org.